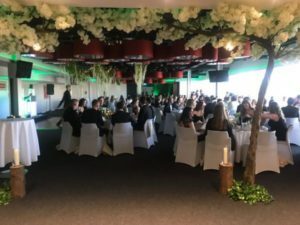 On Friday 18th May, we transformed the Presidents Suite at St Mary’s Stadium, Southampton for the South Hampshire Junior Lawyers Division Enchanted Forest Ball. 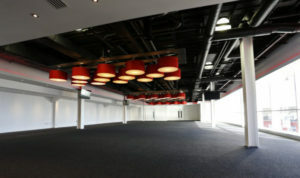 Here is the Presidents Suite before set-up began. We always love to take a ‘before’ photo whenever possible, to really show the difference event styling can make. 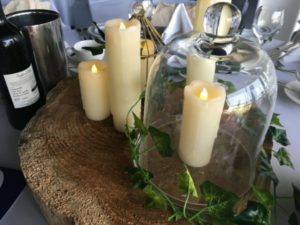 The centrepieces were large log slices with ivy, a glass cloche and LED candles. 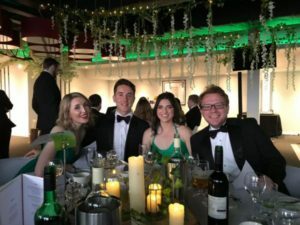 These simple but effective forest themed centrepices tied the tables in with the rest of the room. 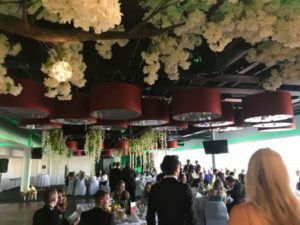 The ceiling in the Presitents Suits at St Mary’s Stadium, Southampton, is quite industrial looking so didn’t fit in with the theme. To draw the eye downwards, we created lines of fairy lights across the room, which we then wrapped in ivy and hung artificial wisteria from. The wisteria hung at just the right height above guests’ heads. Logs were placed around the steel poles with LED candles on them. This was to distract from the more industrial supports and to tie in with the enchanted forest theme. 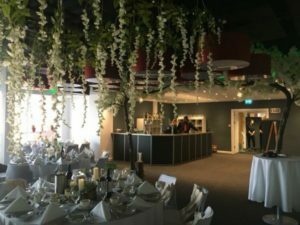 The visual impact that venue styling can have is incredible. 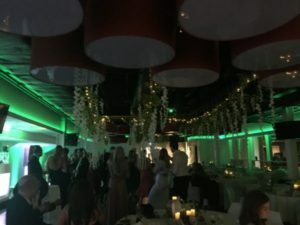 When guests first walk into the room, having that WOW factor will make the event memorable from the moment they arrive. When the light fades, the main room lights are turned off and the fairy lights come into their own. The Presidents Suite also has colour changing lights around the edge of the ceiling. Obviously green was chosen on this occasion to tie in with the theme. 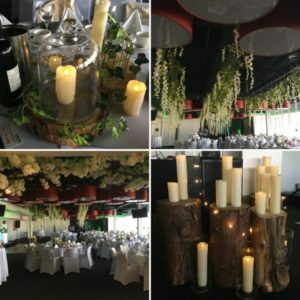 South Coast Events are an event planning company based in Bournemouth, Dorset. We provide event management, event styling and event prop hire across Dorset and Hampshire. 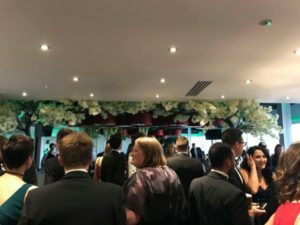 We organise corporate staff and client events, award ceremonies and private parties, including themed events.